The new season of ITV's flashy period drama Victoria has so far seen the queen dealing with Chartists, an arrogant new foreign secretary, and the sudden return of her half-sister, complete with laboured German accent. Audience numbers are dwindling, the reviews are poorer than ever, and it looks as if things will only get worse, thanks to formidable ratings rival Line of Duty. There have been breathless reports of catfights between Kate Middleton and Meghan Markle almost since the moment of her engagement to Prince Harry, but the gossip escalated last winter when it was announced that the 'Fab Four' - as the British press has dubbed Prince William, Kate, Harry and Meghan - were to divide their households. No longer would all four bunk together in Kensington Palace: the newlyweds were striking out on their own in Windsor. Was it simply a case of siblings growing up and out of each others' pockets? Or was there more to the story? Recent reports indicate that the feud is really between the boys, with the two reputedly falling out after Harry felt William wasn't making enough of an effort to welcome his new love. Brothers at loggerheads, not to mention one's the future king and the other doesn't want to live in his shadow? The drama writes itself. Speaking of Andrew: a new documentary, The Royal Family At War, alleges that the Queen's favouritism for her younger son has caused a rift between the brothers. As heir to the throne, Prince Charles has a very different relationship with their mother, while his bond with his father is said to have been fraught from an early age, as depicted in Netflix's royal drama The Crown. The pressure between the brothers and their parents could surely be mined for some cartoonish conflict, although it's more likely to be communicated in icy glares and witheringly passive-aggressive asides than a riotous EastEnders-style fistfight. The story of the Markle family breakdown is a heartbreaking one, yet it's tinged with the camera-ready explosiveness of a Kardashian family showdown. Meghan has refused to play along, but that hasn't stopped her father Thomas and half-sister Samantha from seeking their own 15 minutes of fame, staging paparazzi photoshoots and appearing on talk shows to deliver humiliating assessments of the new Duchess of Sussex. 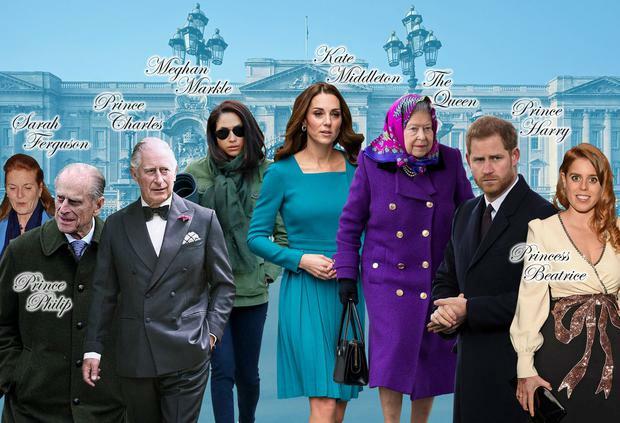 In our fantasy soap, Meghan's estranged family would neatly fill the role of the fame-hungry Americans who are distinctly not, as columnists wryly put it, 'PLU' (People Like Us). We're used to the sitcom trope of the obnoxious in-laws, and the Markles would be guaranteed scene-stealers. Now that both princes are married, there may not be much scope for youthful dating escapades, unless the show were to take in the love life of Princess Beatrice and her new boyfriend, multimillionaire property developer Edoardo Mapelli Mozzi, also known as Edo. Edo had been living with another woman - his fiancée of three years and the mother of his two-year-old son - before he began dating Beatrice. Palace sources insist he had ended the relationship months before he even met the princess, but with whispers of an impending engagement, the challenges of navigating a blended family could provide plenty of soapy fodder. With nicknames ranging from 'Hurricane Meghan' to 'Duchess Difficult' to 'Me-Gain', reporters have the knives out for Meghan. The backlash against the newest member of the family has been fierce and often brutal, with courtiers alleging she made Kate Middleton cry at a bridesmaid dress fitting for her daughter Charlotte, engaged in a battle of the bling with the Queen over banned tiaras, and shook up the family with her "opinionated personality" and 5am emails. Stories about her demands for the royal wedding and her flashy New York baby shower paint her as a Hollywood diva - plum material for a high-camp Dynasty-style villainess. In a moving private moment, we'll get to see the other side of the story: a powerful woman who can more than hold her own and refuses to submit to the ridiculous rules of an antiquated institution. In a Downton Abbey-style twist, the staff quarters would be filled with just as much plotting and peering as upstairs. For starters, the courtiers are quick to run to the press to express their disdain for Meghan's zealous work ethic and Harry's emotional outbursts, such as the time he reportedly yelled at an aide, "What Meghan wants, Meghan gets!" Of course, it is these aides, rather than the royal family itself, who are speaking to the tabloids, so maybe the real intrigue lies in exploring what's going on between the staff and the royals - perhaps a bitter courtier getting their revenge by tampering with the yoni oils?